More than 1,800 students graduated from USC this week in the largest round of graduation ceremonies ever held by the University. Twelves ceremonies from 10-12 April featured plenty of pomp and circumstance as USC awarded degrees, certificates and diplomas and celebrated the success of its high achievers. Chancellor’s Medals were presented to three students who contributed significantly to USC and the general community while achieving outstanding academic results. The recipients were Bachelor of Education (Early Childhood) graduate Deb Kelsey of Landsborough, Master of Arts (Geography) graduate Renee Currenti of Mudjimba and Bachelor of Laws/Bachelor of Commerce (Financial Planning) graduate Michael Jefferies of Buderim. An Honorary Doctorate was awarded to Chief Justice Susan Kiefel, who in 2017 became the first female Chief Justice to be appointed to the High Court of Australia. 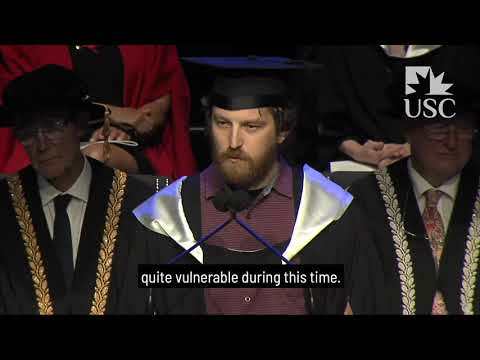 The graduate responses featured some moving and entertaining speeches, including one by Paramedic Science graduate Jason Carter, who this year started studying a Doctor of Medicine with Griffith University at the Sunshine Coast University Hospital. Jason, who received a USC University Medal on Wednesday for achieving a GPA of more than 6.8 out of a possible 7, outlined his journey from being a troubled teen to a talented medical student.